7 Commercial Real Estate & Properties in Edge Hill are listed in 3 categories. We have 4 Retail ShopsSale & Lease , 2 OfficesSale & Lease and 1 Medical and Consulting PropertiesSale & Lease . Edge Hill Business Suite For Lease 16sqm Contact agent Grant Timmi..
Offering a practical and cost effective alternative to running your own office. Located right in the commercial and retail heart of Edge Hill, giving easy access to Cairns CBD and Airport. In this attractive, newly refurbished first floor suite of business offices, the details are taken care of so you can focus on what's important your business. There are no extra usual business expenses no electricity fees, no gardening costs, no cleaning fees, no repairs and maintenance. Conveniently close to vibrant cafes, restaurants, shopping and lifestyle. Shared facilities are male/female toilets. Contact: Exclusive agent Grant Timmins Ray White Commercial Cairns for more information. Retail For Lease - Edge Hill Contact agent Scott Green.. Opportunity to secure an Edge Hill shop available now for lease. In the centre of the cafe/restaurant precinct on Collins Avenue near the Botanical Gardens. Shop area 88 sqm. This tenancy has been a hair salon for past 30 years however is suitable for many other retail uses. The shop will be presented as a clean shell awaiting the tenants new fit out. 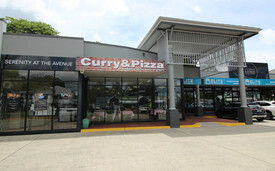 Contact:Exclusive agent Scott Green Ray White Commercial Cairns for more information. Business Suites For Lease - Only 5 Available Contact agent Helen Cross.. Edge Hill Business Suites offers a practical and cost effective alternative to running your own office. Located right in the commercial and retail heart of Edge Hill giving easy access to Cairns CBD and Airport. In this attractive, newly refurbished first floor suite of business offices, we take care of the details so you can focus on what’s important, your business. Five business suites available. F1 16 m² $250 pw + GST F2 13 m² $250 pw + GST F3 11.4 m² $150 pw + GST F4 10.3 m² $150 pw + GST F5 8.2 m² $150 pw + GST Short or long term leases with a minimum 4 weeks and a service package available, to suit all your business needs. Our services package is just $40.00 + GST per week and includes; Client access to business lounge. Business identification on the building directory. Dedicated mobile number answered by a receptionist when required. Messages forwarded to mobile, SMS and email. Mail receipt and send facilities. Facsimile receipt and send facilities. Storeroom access. There are no extra usual business expenses no electricity bills, no car parking charges, no cleaning fees, no gardening cost, no repairs and maintenance. Conveniently close to vibrant cafes, restaurants, shopping and lifestyle. Shared facilities male / female toilet and shower. Furnished or unfurnished to suit your needs. Some parking available on site and additional two hour Council parking nearby and Council buses running every 26 minutes. Situated along side the new Cairns Eye Surgery these offices are ideally suited to the medical industry but would suit other industries just as well. Contact: Exclusive agent Helen Crossley Ray White Commercial Cairns for more information.